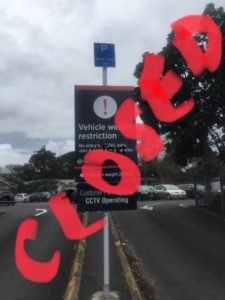 Update: Clonbern Upper Carpark to Remain Closed – Remuera Residents Association Inc.
Auckland Transport have pushed back on Foodstuffs proposal to lease the top level of the Clonbern Road carpark (see Community Meeting 11 April Minutes). AT’s reasoning is that it is unsafe and that it would be shifting the liability to someone else which they will not do. Foodstuffs (New World) believe the car park is safe as it passed structural testing in mid December 2018.